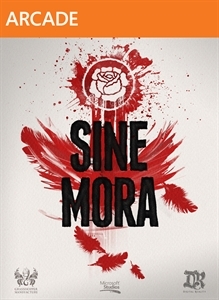 A little while ago a new, very pretty shoot 'em up, Sine Mora, was released on XBLA. It was co-developed by Digital Reality and Grasshopper Manufacturing. I like the game a lot! I think the graphics are gorgeous and the boss designs are inspired with lots of variety. I also like the music a lot even though it's a little understated. Several of the tunes stay in my mind after playing, such as the disco-like theme for some boss fights.The time-slowing ability is fun to use in a shoot 'em up. I liked the game so much I want to play it more! Sadly, while I play I get frustrated by several, smaller design elements of the game that would be easy to fix. I decided to detail these in the hope that someone involved with the development of Sine Mora would read this. I'd love for some or all of these issues to be addressed by the development teams on a subsequent update. In all cases I list possible solutions to the problems, most of which would be pretty reasonable to implement. Problem: Player ships can be damaged by some objects that player bullets pass through. This is the strangest thing I've seen in a long time and it pretty much screws up any sort of reasonable 'discovery' the player can achieve. In a shmup, the player's bullets are like this hands. He uses these to feel out the world and decide what can hurt him and what can't. For instance, the underwater submarine boss turned sideways does not let you pass through it (like when trying to grab powerups) but your bullets and powerups do. In most vertical shmups there is no environmental collision. In horizontal shmups there is often environmental collision. Sine Mora follows that convention, but strangely does not let find out what can hurt your ship until you actually smash into it. Also strange is that some objects block bullets and your ship and some only block (and damage) your ship. The environment-collision inconsistency hampers the game. Solution: If the player ship bounces off things, their bullets and powerups should too, OR if your bullets go through things, don't let that damage the player. Problem: Objects in the playfield are too easily confused with objects in the background or foreground. Even in levels I've played several times, and with enemies that come in from the background (which is often) I'm not quite sure exactly when a ship is able to collide with me or when I can shoot it.This leads to lots of confused shooting and scrambling to figure out where to be. It's also confusing when a tiny turret stuck onto the background is actually shooting and you, can damage you, and could be shot to recover more valuable time (which acts as health here). Pic from a different shmup, Mushihimesama, the background is desaturated and you can see the action more clearly. 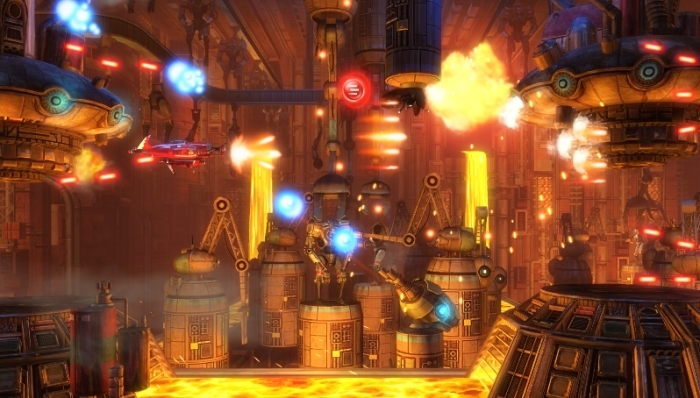 Sine Mora: Some of those turrets are enemies, and some aren't. Solution: Make a clear distinction between objects in the background and playfield, via a fog effect, desaturation (as is already used in the time-slow ability). Could even be an option for the player to toggle in the menus. In our own Shoot 1UP we offered several background visual options including the ability to simply turn off the background (full black) to make the game easier to play for people that struggle tracking things on screen amidst all the action. The game won't look as pretty, but I think giving the player an option to control how distinct the background is would be a huge help and really increase how much they can enjoy the game. I agree that picture of Mushihimesama is washed out and maybe don't have that as the default in Sine Mora. But after I play with 'full graphics' some, I'd probably want to change it so I can see what's happening better. Problem: Powerups quickly fly off the screen. From what I can tell the powerups bounce off the environment (this is fine) but they don't bounce off the "screen bounds". This is very frustrating. You end up really under powered with just one slip up and fighting underpowered is tedious. I think it's also fine if the powerups eventually leave the screen, just not immediately. That red powerup is pretty much as good as gone. Solution: Powerups should be bound to the screen, or travel more slowly, or there should be more created. Problem: It's difficult to discern what parts of the 3D environment you'll crash into and what you wont. This is related, but different than the first point (not knowing what things you can crash into because you're bullets don't hit what you'd expect). This is because the game is in 3D, and has pieces of the environment extending "out towards the player" and has parallax. The ship always emits a vague light on the environment which makes it seem that the developer knew there was a problem, but they didn't go far enough with this possible solution. In most 2D sprite shmups, you can easily discern when you'll crash into the environment. In Sine Mora not only is it tough to tell going up in down in a simple cave setting, but sometimes you're forced to go through a 3D tube while your ship is obscured from view! You can easily bump parts of the tube and be damaged. It's very frustrating. It's tough to decide just when your ship will hit the walls, especially while frantically chasing down powerups. Solution: Make collisions with the environment not damage your ship, like in Einhander, or shear off all graphics to create a cross-section with no parallax, or cast a distinct visual line (like a circle emitting outwards from the ship in a plane parallel to the screen) that collides with environment and shows what the player will hit. Problem: Screen shake is too disruptive and happens often while a big cloud of enemy bullets are about to hit you. Solution: Only screen shake at the end of boss fights when the player is invincible, or make the player invincible while the screen is shaking. Problem: Some enemy bullets are extremely similar to your player ship bullets. When lined up, it's hard to tell when something is coming. This is worst on the train boss. The bullets are long red shapes extremely similar to the players. Solution: Change enemy bullets to not look like the players through color and shape. Problem: Effects cover up things. In the underwater sections, explosion and smoke effects cover up too much of the action. Solution: Make sure the player and enemies, and bullets layer on to of effects. I made this list in the hopes that Sine Mora can be updated to be even more enjoyable, but also for other shmup developers to consider these and other design decisions in your game. I love the game, keep up the great work developers and please consider these issues--thanks! Problem: Objects in the playfield are too easily confused with objects in the background or foreground. Ugh. The game constantly has enemies jumping in and out of the same 2D-plane as you. If you look at something like R-Type Final or most other 3D shmups, enemies don't constantly pop in from the background suddenly. There's this one fight against an airship in Sine Mora where the missiles spiral in from the background, and it's especially hard to tell the moment when they actually 'appear' (as in can be collided with). Quite annoying. Pic from a different shmup, Mushihimesama, the background is desaturated and you can see the action more clearly." I've seen people complain that it's impossible to see anything in Cave's games because of all the medals and stuff that pop up. I don't get how these people can't learn to just pay attention to the purple stuff, the stuff that actually can hit you. Screen shake is too disruptive and happens often while a big cloud of enemy bullets are about to hit you. Screen shaking is very stupid, esepcially to the extent it's used in Sine Mora. However, to their credit, someone on the dev team realized this and you can turn screen shaking off in the menus. One reporter asked how appropriately ready they had been Mr. Burntstrudel clarified, "All of Canada will combine as well as defeat the actual rebellion in order to shield the distinctive existence. We've also involve a contact for the Inuit. The kayak unit is able to be dispatched and when dispersed shortly the actual believed range indicates they'll be within four or 5 days." Whenever requested within the occasion thatwill take component inside the defense related with North america just about all he'd comment is, "they are inclined to be decidedly distinct and thus have distinct possibilities to produce concerning well-earned unique spot."